When I was a kid (and into my late teens/early adulthood), I grew up watching the series 24. Right from the Season One premiere on Fox, my parents and I were hooked, and watching became one of my family’s few rituals. Yes, 24 was a sometimes-ridiculous show and not without its problems, but what I loved was how real it was. This was the first program I watched where the hero really showed the effects of the terrible things he went through, and how he overcame personal and emotional hurdles to somehow save the day. (And we all hope Jack Bauer manages the same in Russian prison, until Kiefer Sutherland returns to the role). The above is one of the main reasons I’m such a fan of the Joe Ledger series by Jonathan Maberry, and have waited with baited breath for each sequel since I first tore through Patient Zero like the book’s pathogen-infused zombies. Much like 24 was about way more than Jack Bauer, this series is about way more than its main protagonist, Joe Ledger, and is filled with a host of deeply-imagined heroes and villains. So the short version of this review is essentially two points: first, that if you’ve never read this series, you really need to; and second, if you’ve read even part of the series and you’re worried that it might lose steam nine books in, your worries are needless. If anything, each book is better than the next, which is a feat I’ve only encountered from one other author besides Maberry. Every Joe Ledger novel features some sort of established horror premise – like vampires, zombies, and even Cthulhu – and gives it a mad science twist, where the cause of this horror is genetic engineering, pathogens or computer software. 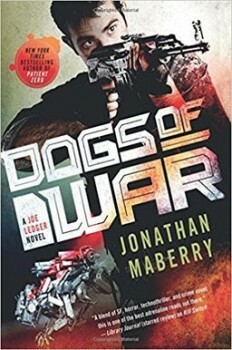 Dogs of War actually opens with a warning from Maberry that the drones and nanotechnology he discusses are based on projects that already exist or are in some stage of development, which possibly makes this novel the most horrifying of them all. But amid the nonstop, Die Hard-esque action that inevitably occurs, there remains that core character development, which continues from several books previous, as Joe Ledger’s allies struggle to remember who they are, why they fight, and why they can win, no matter what odds they face. And with a touch akin to J.J. Abrams, Maberry slowly reveals some key mysteries that go back to the beginning of the series and which, I hope, will be continue to be explored in an eventual tenth book. It’s not every day that I tell people to go back and start an established series at the beginning, since I’m often hesitant to do that myself. But if anything I’ve said above sounds appealing to you, go pick up the first book in this series and do not stop until Dogs of War.